We have no social housing strategy, an unaffordable private rental sector and little prospect for the delivery of affordable housing for those who wish to buy a home. So the housing crisis continues. Another week, another report showing homelessness rising, issues with evictions in the private rental sector and the failure to provide social housing. It’s another week where hundreds of thousands of families, children and individuals across this country are suffering because of the failure of successive governments to deliver a most basic human need for its citizens. That most basic need (and human right) is affordable, secure and decent quality housing. Last week we found out that in February this year there were 912 families, including 1,881 children, without a home and living in emergency accommodation. This means that there is now one family per day being made homeless in Ireland! It also means that the number of homeless children has more than doubled in the space of a year. In January 2015 there were 539 families and 865 children homeless. The current figure of 1,881 children is a 117% increase in just a year. On top of that the Private Residential Tenancies Board found that there were 320 ‘unlawful termination of tenancy’ or illegal eviction cases in the private rented sector last year. This was a huge 40% increase in the number of such cases in 2014. Then there is the reality of the huge stress of the 88,000 households in mortgage arrears and debt (37,000 of which are in arrears over two years). The Irish Mortgage Holders Association (IMHO), who works with up to 20,000 homeowners who are in mortgage arrears or are struggling to pay their mortgage undertook a survey of the psychological impact of this debt on people’s lives. Based on a sample of 500 people affected by debt they found that more than 40pc said they felt depressed either “all of the time” or “most of the time” and over 30pc said they had had suicidal thoughts in the last four weeks. While the Irish Times reported yesterday that one of the key government and state providers of affordable (social) housing, Dublin City Council, is set to halve the number of social housing units being provided. Last year 1,689 additional social homes were provided by Dublin City Council but by the end of 2016, this figure is expected to reach just over 700. These figures highlight a major flaw at the heart of the Social Housing Strategy announced in November 2014. This strategy included €4 billion in funding, and set out how it would provide 110,000 social housing units by 2020. But over three quarters of the units (75,000) are to come from the private rented sector (which is not credible given the lack of availability of private rented accommodation for low income families particularly those using HAP and the Rental Accomodation Scheme. But even worse, only 12,000 units (just over 10%) of the plan are to be direct new build by local authorities or housing associations. The remaining 23,000 are to be provided through some form of Public Private Partnership ‘off-balance’ sheet private financed delivery. There are major problems with this approach. 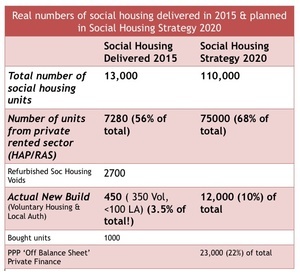 The table below sets out clearly the numbers of actual new social housing units delivered last year and the numbers planned in the overall Social Housing Strategy. It shows that it is only a ‘social housing strategy’ in name, because only a tiny proportion of it involves building actually new permanent social housing by local authorities and housing associations. It is clear that the housing crisis is an unprecedented social, humanitarian and economic crisis. 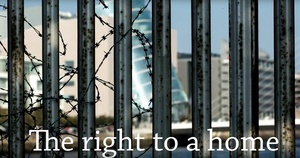 We have a social housing strategy that has no social housing, no end in sight to the misery for families being evicted, in mortgage arrears, on the social housing waiting lists and being made homeless, and no coherent strategy for making the private rental sector an affordable and secure tenure for those who are reliant on it, and little prospect for the delivery of affordable housing for those who wish to buy a home. 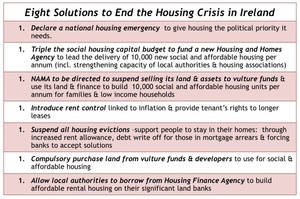 Based on my extensive academic and policy research, practical experience from being a community worker with Barnardo’s in Dublin’s inner city, and from my campaign experience with housing rights campaigns,I have identified eight solutions that could address the housing crisis which are outlined in the table below. I have made these the core of my campaign to try and get elected to the Seanad on the NUI Colleges Panel. It wasn’t an easy decision to stand in the Seanad Election and it hasn’t been an easy campaign for me. I have struggled to try and run the best campaign I can (and thanks to all those who have supported me and got involved!) while also working a full time job and looking after my three young children. But I believe it has been worthwhile. I know the Seanad is elitist and undemocratic and it is time that all citizens were given a vote in Seanad Elections. 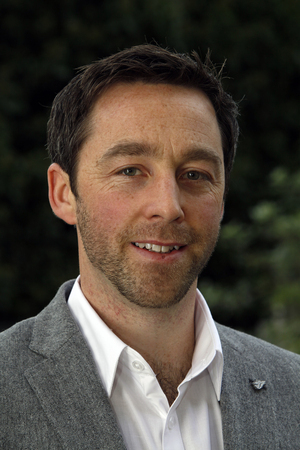 But I have tried to use the campaign to highlight the issues like the housing crisis (see, for example, the short video I made above), issues of poverty, inequality and community disadvantage, Living Wages and quality jobs, the importance of local community and youth services, quality and accessible public health and education systems and affordable childcare. In short I have tried to highlight the policies that could address poverty and inequality and make Ireland a more socially just and economically fairer and more sustainable country. Whatever the outcome of the Seanad Election (and there is still time for those with a Seanad NUI Vote to post their vote by next Monday, April 25th), I will continue to highlight these issues. There are also many groups and organisations (including NGOs and charities like Simon Communities, Peter McVerry Trust, Focus, Inner City Helping Homeless, and active campaigning grassroots groups like the Irish Housing Network, Housing Action Now and homeless campaigners like Erica Fleming) who are doing incredible work to address the escalating housing crisis by supporting those made homeless, providing housing or campaigning for the housing crisis to be addressed. If elected I will raise their issues and concerns to a national level in the Seanad. A major reason why the Seanad has not been reformed to give all citizens a vote and why it is seen as irrelevant by most people is that the majority of Senators have been part of the political establishment and have failed to prioritise radical reforms and progressive social change. So those of you who have a vote in the Seanad NUI face a choice. You can use your vote for a candidate like me who has demonstrated his long term commitment to challenging the consensus and campaigning for social justice. Or you can allow a conservative establishment politician to fill that space. It’s your choice! Finally, I’ll be at a very important housing and homeless protest this Sunday from 12.30 noon at the GPO as part of a citizen’s day of action and protest to mark the actual commemoration date of the Easter Rising. It’s a genuine commemoration of the spirit and vision for a Republic of Equality outlined in the 1916. Posted in Misc and tagged Dr Rory Hearne, rory on wednesday at 5:59 pm on April 20, 2016 by Admin. The answer to socialism is not more socialism. The future that Mr Hearne envisages (Commie Utopia) will not happen. In his idealistic world, he is in charge of the little people who are totally dependent on The State for their basic needs. What *has* happened and will continue to happen in Ireland is: the high quality people have left or are leaving and low quality people (and their extended families) have arrived or are arriving. Sooner or later, the balance will tip where the productive people can’t keep paying for low quality, unproductive people. Reality is put off in Ireland because of the free money from Europe (Noonan’s bond auctions), consumer sugar rushes from low interest ECB rates (low spec 161 cars galore) and transient US multinationals fueling local economies. None of this is sustainable. Were between I 18 and 30, I would drop everything and leave. Even if you only had a bus fare, go up North and work in a pub. You can rent your own house up there for £400 a month and walk to work. If you have debts, walk away. If you have a job, why continue to pay into a system that shafts you? Great little country if you’re a landlord. “…high quality people…” & …low quality people..” Obviously you didn’t do Honours English in the Leaving! You’re a maze of confusion Marian.. It wasn’t socialism that created the mess with housing in this country. I think I read recently that half of the working population of Ireland are earning 28k or less.. affordable housing is required urgently.. call it social if you want. Best of luck to Rory too. Seems like a genuine guy, has identified important issues. Unfortunately pitch is devoid of how the call to action (vote for him) will achieve the desired results. It’s all ‘awareness raising’ etc. 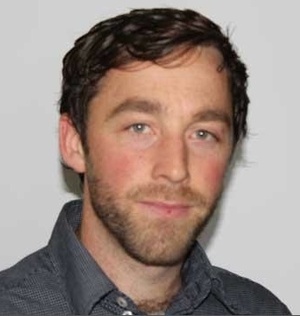 If you get into the Seanad, what exactly are you going to do? Is it going to be all Private Members Bills on about the housing crisis? I’m sure you’d find that doesn’t take up much time, probably voted down by the government, and then what? Continue making long posts on BS saying how awful everything is? You need to tell voters how exactly you are going to achieve your goals. Living and working in Ireland may well be for mugs, “Marian”, but that has nothing whatever to do with socialism in any form. Furthermore the “low quality people” you disdain are in reality the people who have run the country since the foundation of this state. 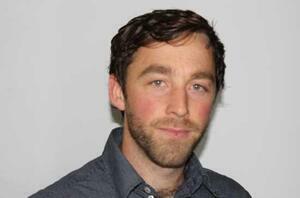 Rory should get together and share ideas with Henry Silke. FG/Lab govt have bled landlords dry and this is partially to blame for rent increases. I now pay €100 a month more in tax than previously, to cover this I have to increase the rent by €200. On top of this you want me to fund cheap housing for some people who won’t work? What’s the extra 100 euro for Ollie? Eh no they haven’t. You pay either 20% or 41% on the rental income, depending on the amount and your other earnings.. You get relief of 75% of the mortgage interest payments and get relief also on repairs and maintenance fees. You don’t want to pay tax on the rental income, and you want to be left with an asset that someone else paid for. And you want them to pay your taxes too. Go way out of it. You sound like you’re fond of the gravy train yourself. If rent control is unconstitutional, let’s change the Constitution. let people take responsibility for their own lives. SIngle mothers, go make the father of your children contribute. It’s not unconstitutional, don’t mind him..
“There seems to be a lot of ideology involved in this debate. The mainstream economics profession and the property/landlord lobby appear to argue that we shouldn’t introduce rent controls because it interferes with the “free market” or the status quo. But this is silly because the market isn’t free; it is rigged at every stage and the “status quo” doesn’t deliver stability but delivers massive instability. Most tampered with.. I love all this talk of can’t be interferring in the market from these fuppsh*tes like Ollie.. There are rules and laws and taxes in place for affect the property market… There’s no market in nature. It’s only interfering when it doesn’t suit some. Abolish the so called Property Tax, it is nothing more than a Family home tax, put a proper investment tax in its place, which taxes all investments be they houses to rent, commercial property to rent or and including farm land that is bought by non farmers for renting . Next change to make is to bring in laws that regulate Estate Agents way of doing business, what ever it takes to end the price exaggeration and poling of property prices.